Prepare the polenta according to the instructions of the package (the timing and amount of water are very different depending on the type of corn flour). While the polenta is cooking, prepare the shrimp. Cut the white part of the leek into thin slices and place it in a pan with olive oil and garlic. Let it cook over low heat for about 10 minutes, stirring occasionally. Add the wine and let it evaporate, then add in the tomato sauce. Cook for 1 minute, then add the shrimp and cook over high heat for 5 minutes stirring the shrimp. 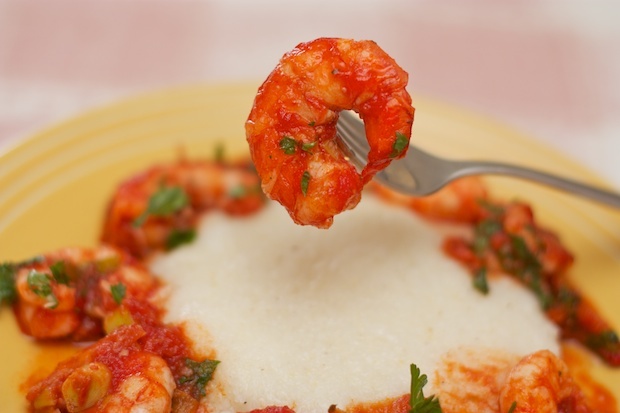 When the polenta is cooked, add it to individual bowls for each diner and surround it with the shrimp. Serve immediately while still hot.